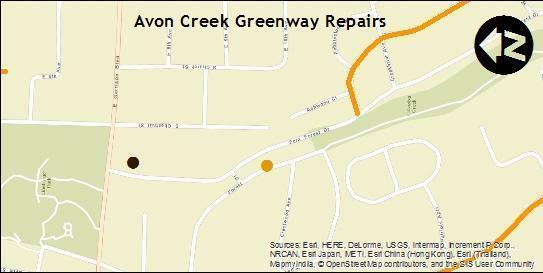 Project Description: This project will repair a portion of the Avon Creek greenway that has collapsed between Haygood and Forest Drive. The gabion wall has failed and will be removed. The greenway will be relocated into the existing Forest Dr. right of way. Forest Drive will be permanently closed in this location. Current Status: Construction is complete. We hope you enjoy your greenway! Remember the greenways are open from dawn to dusk. Call (704)922-8677/8687 for animal control/complaints. Call (704)866-6839 to report vandalism (such as graffiti),repairs needed, or to ask Park-related questions. PROJECT CONTACTS: City of Gastonia Engineering 150 S York Street Gastonia, NC 28052 704-866-6943 Please reference the project name when you call. PROJECT CONTACTS: City of Gastonia Engineering 150 S. York Street Gastonia, NC 28052 704.866.6943 Please reference the project name when you call.